I went to an Ovi App Store developers event at Nokia’s Silicon Valley office in Mountain View yesterday. It was time well spent with informative presentations, good food and drink and the chance to meet and grill some of the Forum Nokia staff about just how the Ovi App Store will work. I didn’t get all my questions answered but I learned a lot and I have new respect for the Ovi Store initiative and Nokia’s commitment to supporting and engaging developers to make the store a serious competitor to the iPhone App Store. One of the things that surprised me was the emphasis in the presentations on Flash Lite and especially Web Runtime development. Native Symbian and Java Me were mentioned as available technologies and Qik, which is a native app, was demoed but WRT was the technology that got most of the exposure. Nokia clearly wants to get iPhone and Web developers interested in the WRT platform. I think this makes sense, Symbian native development is notoriously difficult. WRT has got to be more accessible. When I played with a few WRT widgets on my N95 I wasn’t too impressed with the capabilities of the platform. But that was WRT 1.0. Version 1.1, which is shipping with the touch screen FP5 phones like the N97 and 5800 is a big improvement. It opens up access to the camera, location, PIM data and media player to give WRT apps (“Widget” seems to have been deprecated as too wimpy a name) the power of native and Java applications. There were some impressive demos of WRT applications playing videos and retrieving the cell-id to display locally relevant content. With WRT 1.1 apps running in the background can even display active content like a stock ticker or weather alerts on the phone’s idle screen. The Ovi store will run as a native application on S60 phones and a Java one on S40 5th and 6th edition devices. There will also be a mobile web version for phones that can’t run the store applications. The store is on target for an early May launch in Australia, Germany, Italy, Ireland, Russia, Singapore, Spain, U.K. and U.S. At launch the store will be available on 75 devices. Supported content includes WRT, native and Java apps, and “handset customization” which I think means ringtones, wallpapers and themes. Pricing tiers vary by country. For the US , pricing has been tentatively set at from 99 cents to $128. Free applications, including ad supported ones, are also allowed. Billing will be by credit card and/or premium SMS. The biggest question I had going into the meeting was the Ovi Store’s certification and signing model. 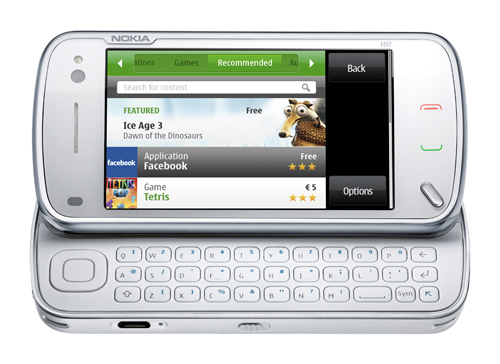 Several reports from MWC indicated that Nokia was insisting that all apps be Symbian Signed or Java Verified. Those are third party programs that involve a considerable amount of red tape and are time consuming and costly for small developers. There are initial fees of $200 and up plus from $20 to several hundred dollars for each application submitted. Apple took a different approach, which RIM and Android also adopted, of charging developers $99 ($25 in the case of Android) to join a developer program and then allowing them to submit an unlimited number of applications with no additional charges for testing and signing. Everything is done through Apple, RIM or Google, there are no 3rd party testing houses and certificate authorities to deal with making for a much more streamlined process. I asked Forum Nokia’s Bill Perry about the signing issue and he said that contrary to what had been reported, Nokia has not yet decided on the signing and security model for the Ovi Store. Bill said that an Apple like model where Nokia picks up the costs of testing and signing is one of several being considered. I hope Nokia decides to go with the Apple model. I believe it is one of the core components of the iPhone store’s success. Sure Apple is arbitrary in their approval process and their criteria for what gets approved isn’t transparent. But it sure beats the complexity and cost of Symbian Signed and Java Verified, especially for the lone developers and hobbyists who are responsible for a large share of the apps in the iPhone Store and Android Marketplace. If you are interested in developing content for the Ovi Store you can sign up as a publisher at https://publish.ovi.com. Also, for Northern California Developers, Nokia is holding free “Publish on Ovi” sessions in Mountain View every Wednesday, 3:30 to 5 PM from March 25 through May 13th. Events will include technical presentations, one on one help with development issues and refreshments. They will be held at the Nokia Mt. View Campus at 313 Fairchild Avenue. This entry was posted in Nokia and tagged app stores, application signing, Ovi, WRT by Dennis Bournique. Bookmark the permalink. I can only hope they will pick the Apple model for testing especially for Java applications this can revolutionize the market. Hopefully they will also supply a “proper” manufacturer signature as part of this. Nokia hasn’t released a list of supported phones yet, only that the store will support 75 devices. The N82 is very popular, I’d be surprised if it wasn’t supported. Ovi App. Store is on N97 and 5800.